SS Graphics Inc. would like to welcome Matt Elden to its production team. 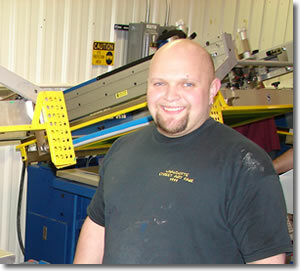 Matt joins SS Graphics as a Screen Printing Press Operator. Elden will be a first shift press operator on our Weather Resistant Poster Board Yard Sign production line. His primary duties will include long run multi-color campaign sign production. what a handsome guy. I know matt very well, he loves meatloaf, warm cuddles, talking about the weather, seansonal snickers bars in the shapes of christmas trees, and coffee with 3 splendas and 3 creams! Order Parking Signs. Over 150 styles in stock. We also make custom signs. Yard Signs - Order Online. Political, Business and Event. Fast Production, Factory Direct. Why Life Rings Make Great Gifts! Site specializing in Yard Signs, Traffic and Parking Signs, and Custom Signs and Decals. Featuring Personalized Life Rings, Buoys and Boat Dock Products. Also, boating apparel and boating gifts. Wholesale Yard Signs. Apply to become a dealer today. Yard Signs Print and Ship in 2 Days Guaranteed! Free Shipping! Free Proofs! Tips for designing eye-catching political yard signs. Subscribe to this site. If you use My Yahoo, Newsgator, Pluck, Rojo, Bloglines, or Google for your Home Page or News Reader click this link.